WASHINGTON—Thinking back to a far simpler time, veteran congressman Chuck Grassley (R-IA) told reporters Thursday that he could still remember when his inaction on gun violence actually presented a moral dilemma. “I can still recall how, years ago, deciding not to take any steps to address universal background checks or a broken mental healthcare system following a mass shooting felt like a real, concrete struggle,” said Grassley, a member of Congress since 1975, reminiscing on how he used to do a lot of mental gymnastics to justify his idleness on the epidemic and would frequently lie awake at night contemplating whether there was blood on his hands. “I have a lot of memories of going back and forth on whether accepting all this money from the NRA made me complicit in all of these deaths. 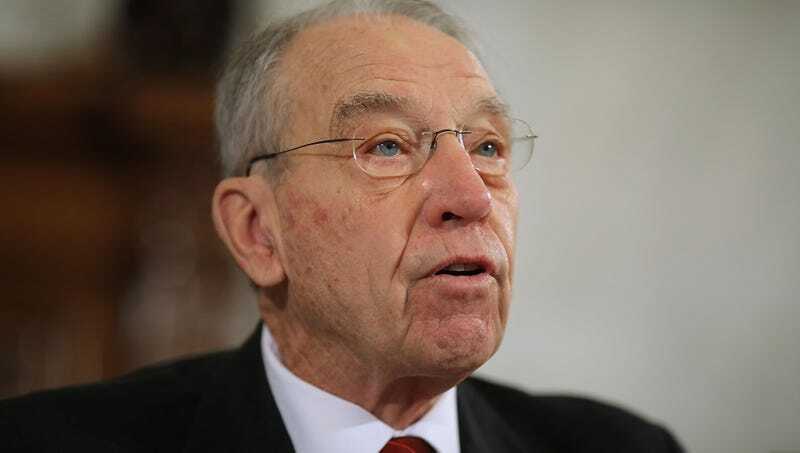 I would sometimes get so troubled by it, I’d even ask my wife or my friends if they thought I was a good person, but nowadays, I just fire off my ‘thoughts and prayers’ tweet without thinking about it and just keep going about my day.” At press time, Grassley admitted that he was starting to get a bit bored after continuing to talk about the subject for so long.